Today is September 4th, 2017. This would have been my Mom’s 78th birthday. She left the earth almost 5 years ago, and as anyone who has lost a family member will understand, there isn’t a day that goes by that I don’t think about her and miss her terribly. It seems like a good occasion to tell the story of how Mom used to tear it up on video games. 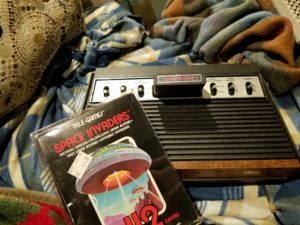 Not too long ago, my interest in Atari games was rekindled, and I have written about it on this blog if anyone is interested. I also recently found the old Atari 2600 that I had as a kid. This was actually the second 2600 that lived in our house. This was the one I won in a drawing at a local record store to celebrate the release of Journey’s album Frontiers. This was the one that was all mine, lived in my bedroom, and nobody else got to put their grubby paws on it. 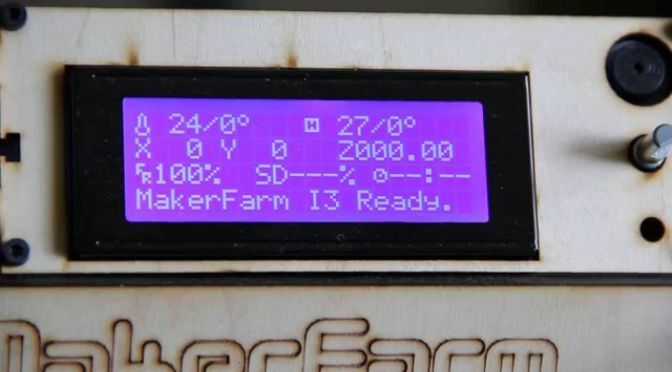 But that’s another story, and this one is about an entirely different 2600. It was Christmas, and it must have been 1980. Somehow, my parents had been kind of sneaky, and while we kids were tearing open any and all packages that had our names on them, another, larger box showed up unannounced and unnoticed. After we stopped to catch our breath, someone noticed this big new arrival, and we all tore into it. I don’t remember who it was, but someone yelled out “It’s an Atari!”. As the wrapping paper gave way, what we saw was something wonderful: a Sears branded “Tele Games Video Arcade”. Whatever Sears wanted to call it, we didn’t care, it was an Atari! There was also a smaller box, clearly attached to the bigger one. I’m not sure I recognized it at the time, but this was a major turning point for me. In that box was another game, one that would soak up hours and hours of my time, and touch off the first major video game rivalry of my then-young life. In that box was Space Invaders! Once we got the console hooked up, we didn’t do much else that day. We passed the joysticks back and forth, everyone taking their turn. I was absolutely captivated. In the event that you’ve somehow missed out on four decades of video gaming, Space Invaders was the first port of an arcade game to a home console. 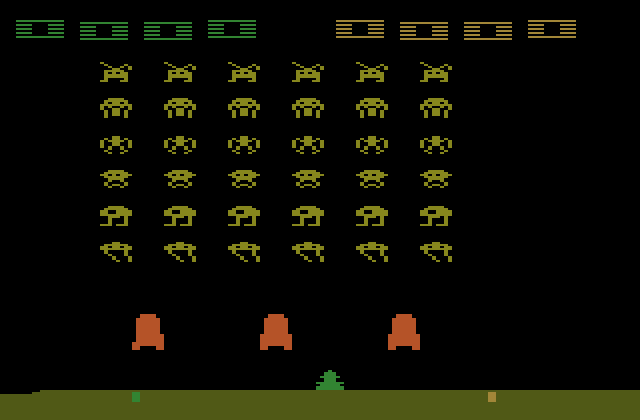 In the game, the player moves a “base” left and right across the bottom of the screen, and fires missiles upward at a grid of six rows and six columns of aliens, who move back and forth, and when they reach the edge of the screen, they jump lower, and then start marching back in the other direction. They also shoot missiles down at the player. If the aliens land, the game is over. Eventually, Christmas ended, the new year rolled around, and we went back to school. I didn’t have much homework then, which was good, because I probably would have ignored in anyway. I had Space Invaders at home! I still don’t know how it works: do people love games that they’re good at, or do people get good at games that they like? 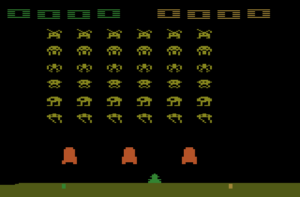 I don’t know, but I do know that, at least among my friends and family, I was pretty good at Space Invaders (Or “S.I.” as we took to calling it around my house). Someone taped a sheet of paper to the wall next to the TV/gaming setup. Everyone’s name was written across the top, and their high scores were written underneath. When someone set a new record, they crossed out the old score and wrote the new one underneath it. I had more crossed out scores than anyone else, and my dominance was undisputed. Eventually, things started to get serious. One evening, I was having a particularly hot run, and it looked like I was going to surpass 10,000 points. The cool part of that is that the maximum score the Atari Space Invaders would display was – you guessed it – 9,999. When a player passed that score, the counter reset to all zeros, a process known as “Turning it over”. So finally, this night, I was getting really close. The moment arrived, and I shouted out as loud as I could, powered by the exuberance of pure victory, “I TURNED IT OVER!! !” In seconds, the family had assembled, and I was sure they were all quite happy for me. Afterward, my dad made some kind of comment about toasting “To turnovers”. It was a big night. On the score sheet, my closest rival, who never actually got too far behind me, was Mom. It occurs to me now, much later, that she was probably something of an insomniac. I never seem to recall waking up in the middle of the night, as kids sometimes do, and finding Mom anywhere except the living room, working a jigsaw puzzle, watching TV, or, those days, downstairs playing Space Invaders. As such, she had some pretty well-honed gaming chops. Of course, I wasn’t going to sit idly by and let my Mother take my SI crown, at least not without a fight. I knew I had keep my game tight and on-point. So I played and practiced, and finally went on an absolute marathon, and rolled the score six times. That’s sixty thousand points! I felt that was pretty unassailable, and I recorded my score and went to bed. That record stood for weeks. I was pretty sure nobody would ever top it. I was also about ten years old, so I also found other games to play, and other things to be excited about. Honestly, Space Invaders kind of lost its hold on me. One day, though, as I was wandering by the score sheet, something caught my eye. I was no longer the SI Grand Champion! Mom had also rolled the score six times, and had managed to get further than I had on my record-setting run! Was I going to sit back and take it? Was I going to let my own mother beat me at a video game? Well, actually, yes. As I have already said, I wasn’t that interested in playing Space Invaders much more, and was quite content to move on to whatever was next. So for the rest of her life, Mom held the title as the family’s Space Invaders all-time high score record holder and undisputed champion. Sears branded Atari 2600 “Light Sixer” and Space Invaders game cartridge. Recently, when I found my old 2600, the one I won in the drawing, I was happy to discover that it was still in pretty good shape. It just took a little bit of cleaning and some TLC, and it now works great. Our old family Sears Tele Games Video Arcade is long gone. I’m sure one of us took it apart, and I shudder to think of what may have happened to the pieces. I did feel, though, that it was important for me to have, as part of my collection a Sears Light Sixer, and a boxed copy of the Sears branded Space Invaders game cartridge. What better way to pay tribute to my first gaming rival? The Columbia Gorge is about 40 minutes or so East of where I live. My entire life, it’s been an escape. Every tourist who has ever visited the state of Oregon is required by law to look at Multnomah Falls, and it long ago slid off my radar. I’m that guy that simply cannot stop . . . → Read More: The Gorge is burning, some thoughts on redemption. Oddly enough, I ended up buying this game, quite by accident on the first weekend of its release. It’s been a while since I’ve had any real fire in my belly about an upcoming game, and, in fact, there is at least one game I picked up more than two years ago at a midnight . . . → Read More: Horizon: Zero Dawn, a review. Fallout 3 was released in 2008, and Fallout: New Vegas in 2010. For five long years we’ve been waiting for more Fallout. Over the years, there had been some cruel hoaxes, . . . → Read More: Fallout 4!